I have adored Ina Garten, the Barefoot Contessa for quite some time now. I love that her food and style are elegant without being complicated or pretentious. Every recipe of Ina's I have ever tried has been absolutely delicious and I have honestly learned so much of what I know about cooking from watching her show. Always the gracious host, Ina makes even the most mundane event an occasion. Whether she is making dinner for her husband Jeffrey, having some girlfriends over for brunch, or having cocktails and hors d'oeuvres with every fabulous gay man on Long Island, she always sets a beautiful table with a lovely floral arrangement. The result is always elegant and inviting, never stuffy. I admire Ina for her kind spirit, killer ability to cook without being professionally trained, and her knack for effortless elegance. 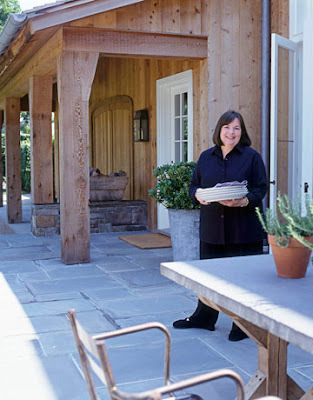 One of the major reasons I tune in to Barefoot Contessa is so that I can see Ina's gorgeous home in The Hamptons. I'm always drooling over her beautiful kitchen and amazing gardens. Ina recently added a barn. This certainly isn't what you would normally think of when the thought of a barn enters your mind! 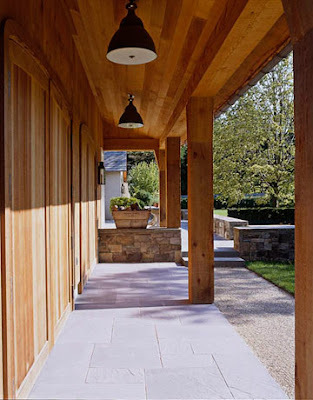 Ina's barn was designed with the help of architect Frank Greenwald, who along with Ina, drew his inspiration from the simple and elegant buildings of the Belgian countryside. Ina essentially had the barn built as a work space. "Oh my gosh, we were cooking, and filming, and writing cookbooks, and everything else in our house. It was crazy! I needed another place to go." Robert Stilin helped design the interiors, while Ina made sure that the kitchen was extremely functional and included and included a counter that is 18 feet long. "My assistant and I work together, so we needed a really long counter. It's divided by a sink in the middle — very efficient. You don't want a huge kitchen. If it's too big, you need roller skates to get around it. The work area itself is actually the same size as it is in the old house." 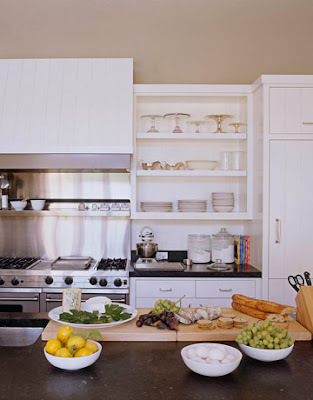 According to Ina, people frequently make some common mistakes when planning their kitchen space. "One [mistake] is that the work space is in the flow of traffic, so people have to walk through your space to get somewhere. And the second mistake is the location of fridge, sink, and stove. That classic triangle. Sometimes the fridge is on the other side of the counter. It's unbelievable — I mean, how many architects don't cook! They look gorgeous, but they don't work." 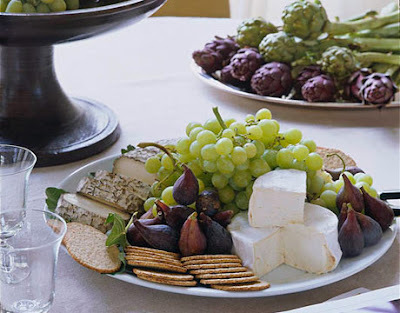 A gorgeous fruit and cheese platter made by Ina...How simple is that? 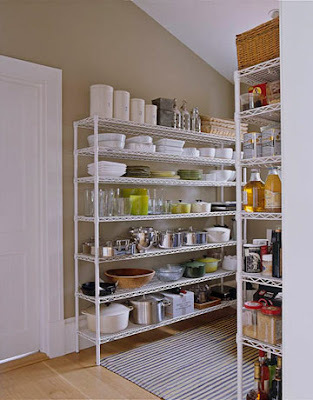 Ina's spacious, organized pantry is stocked with allof the best ingredients and supplies, naturally. "When I'm filming, the bedroom is my place to retreat. When I'm not, it's a great guest room." How amazing are those lighting fixtures? In regards to the overall look and feel of the house, Ina says: "It was important that the house not look brand-new, that it felt like it belonged here, had a history." I want to have this woman's life. Seriously, what could be better than tooling around the Hamptons in a BMW convertible, all the while knowing that you have a FABULOUS home to go back to and a husband who really appreciates your cooking? Not to mention all those millions in your bank account...Sigh. Very well said, Sherri! She really does live a lovely life. I think she and Jeffrey are so sweet together. It's evident that they still adore each other after so many years. What a great post, and I, too am a big fan of Ina. I had the pleasure of meeting her a couple of years ago, and she is every bit as gracious and kind to a complete stranger. She's amazing. I think her new cookbook comes out soon - can't wait for it.